Review of Lost Generation Space’s ‘Bangun – Abandon Project‘. Published in Off The Edge, March 2008. Since forming in early 2004, artist collective Lost Generation has produced projects that genuinely posit alternatives in Malaysian art discourse. ‘Alternatives’ not only as in opposition to a constructed (imagined) mainstream, but also in a generative sense that enlarges the debate for us all, especially regarding the role of independent art practice. Their latest project Bangun is no exception. Held over three evenings in February, it was a site-specific event featuring 25 international and local artists. The site was a sprawling complex of three vacant buildings next to Lost Generation Space, a bungalow in Robson Heights that the collective rents and operates as an art space. In an article on kakiseni.com, writer Zedeck Siew observes that ‘Lost Generation Space’s contribution was that they provided us with an excuse to explore this [abandoned] space’. It is true that in a project like this, art cannot be seen independently from the context it has consciously inserted itself in. In Bangun, the former is indeed overshadowed by the latter. Bangun isn’t the first project to deal locally with the subject of abandoned buildings. From 2000 to 2003, Simryn Gill traveled the country photographing empty apartments, incomplete projects and mini ghost towns. The result was a collection of 116 images published as a book titled Standing Still. The images are as haunting and poignant as you imagine, but are also immensely, elusively beautiful. Similarly, many works in Bangun almost revel in the desolate aesthetics of the abandoned site. Ilham Fadhli Shaimy fills holes in the rotting floor with plaster from toy cement mixers. Dean Linguey frames little stalagmites formed by water dripping from a leaky ceiling with shards of found glass. Tan Wai Ding gathers broken electric fixtures and arranges them into a maze on the dusty floor. In the ultimate homage to ready-made beauty, Teh Leong Kwee simply places a makeshift frame over any picturesque surface – a mouldy bloom here, a stain on the wall there. It is interesting how the sad dilapidation of this site been treated with nothing less than celebration and reverence. Note how LGS positions the event: ‘Bangun in Bahasa Malaysia means Wake up! Attention! In this project the artists are saying – Wake up and notice the abandonment of buildings (bangunan) in KL!” The word used here is ‘notice’, not ‘save’, or ‘halt’, leaving the motives of Bangun richly ambiguous and open to debate. Why this attraction to the aesthetics of decay? Could it be that we do not in fact look at abandoned buildings in an entirely negative light? This is what Sola-Morales Rubio suggests in his essay Terrain Vague. He writes that these spaces are ‘places where the city is no longer’. They do not house anyone, they are not monitored, they do not produce anything – in short they are everything that the city isn’t, a ‘negative image’ of the city. Not negative as in ‘bad’, but more like the inverted mirror of our beloved and fragmented KL. This inversion produces a void or absence, which also represents possibility and potential – that of things happening differently than what we have been made to believe by those who chart the development of this country. Walking through Bangun on a rainy evening, the whole place seemed porous – some corners letting in the rain and sun, holding both in rotting wood and plaster; other corners underground blanketed by an irredeemable silence and darkness. As Sola-Morales Rubio suggested, this porosity seemed to me ‘as much a critique as a possible alternative’ – to the steady proliferation of this or that jaya, to the highways and shopping malls and the whole sterile time-space grid of Malaysia Wasasan 2020. While some artists let rotting chaos creep up and become part of their works, just as many seemed to devote energy towards caring for their space. Tobias Richardson’s hanging sculpture revolved silently in a little room the artist spent a substantial amount of time cleaning and repairing. Haley West did likewise to what appears to have been a former kitchen – wrapping up debris in plastic as ‘gifts’ for viewers to take away, as well as hanging golden tinsel off a creeper on the wall. Aliza Ayob planted bright pink plastic flowers on a piece of barren lawn. These efforts may be seen as attempts at rehabilitation. But for what sake and for whom does this rehabilitation occur? Just as an abandoned building may not be seen in a completely negative way, so rehabilitation cannot be taken only to mean something good. To rehabilitate something is to not only love and care for that thing, it is to also change it irrevocably. Certeau writes that spaces like Bangun’s site do not only have a history, they ‘function as history’. ‘Ghosts in the city’, indeed. Like ghosts these spaces exist in the present, yet elude it. Like ghosts, what does it mean to take them and turn them once again into places for the living? How should we go about it? Both Certeau and Sola-Morales Rubio agree that these ghosts should not be exorcised violently, but be placated with continuity. Why? Let us put it this way: why, if they cared so much about its disrepair, did the Bangun artists not invade the site like an army of ants and make it habitable again? Could it be from a barely grasped suspicion that to fully ‘rehabilitate’ (clean, clear, renovate, improve) the place would mean returning it once again to the homogeneity of the city – to the real estate market hungering for ‘heritage rich’ sites, to the empirical logic of progress and development? The value in Bangun lies not so much in a rallying cry to ‘save the buildings!’, but in calling attention to, and subsequently adding to this multiplicity of the city. It opens up many spaces – both physical and metaphoric – to questions, debate, thought, perhaps even action. This is how art acts. 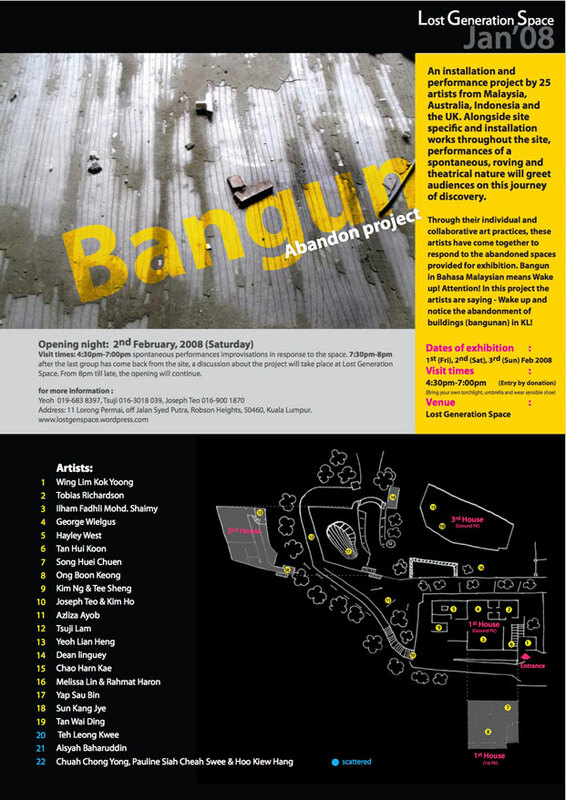 Lost Generation Space’s “Bangun – Abadon Project“, 1 – 3 Feb 2008. Ignasi de Sola-Morales Rubio, “Terrain Vague”, Anyplace, ed. C.Davidson, The MIT Press, Cambridge Mass., 1995, pp118 – 123. Michel de Certeau, “Ghosts in the City”, The Practices of Everyday Life, Vol 2, Uni of Minnesota Press, Minneapolis, 1998, pp133 – 143.